Imaging sensors supplied by British-based technology firm e2v are behind the first-ever close-up images of Pluto that have amazed scientists after a nine-year journey to the icy planet. Cameras on board Nasa’s New Horizons spacecraft have revealed astonishing close-ups of Pluto, showing a new ‘crisp view’ of the planet’s largest moon, Charon. 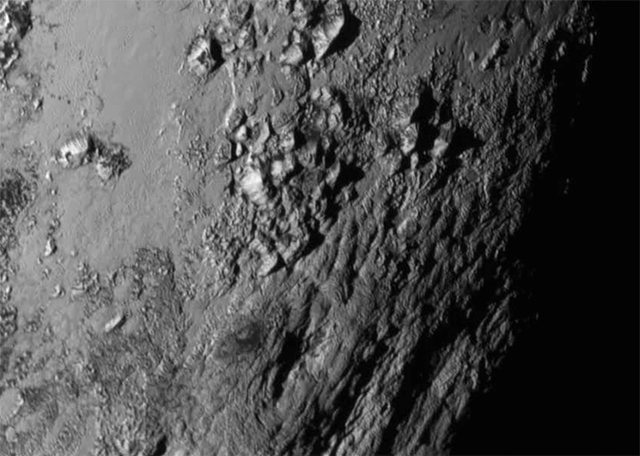 One image, near Pluto’s bright, heart-shaped feature, shows a mountain range as high as 11,000ft. Alan Stern, principal investigator for the project, said: ‘New Horizons is returning amazing results already. But scientists say they are surprised by the apparent lack of craters. Launched in 2006, New Horizons travelled at 33,000 miles per hour to complete its dramatic Pluto fly-by. Matt Perkins, president of Space Imaging at e2v, which is based in Chelmsford, Essex, said: ‘At e2v we are overwhelmed to once again see our technology make history as our image sensors captured the first-ever close-up pictures of Pluto. e2v, which has supplied technology for more than 150 space projects, including the Hubble telescope, provided two specialist imaging sensors for the Pluto mission. The first, LORRI (Long Range Reconnaissance Imager) is a black & white telescope camera with a ‘1k x 1k’ pixel imaging sensor. It also capable of providing high-resolution geological data. The second is a multi-colour scanning imager called Ralph, which provided full-colour images of the planet’s surface. Paul Jerram, chief engineer of Image Sensor at e2v, explains: ‘Ralph is highly bespoke, in fact it is seven different CCDs (charged-coupled devices) made on the same substrate, providing a complete focal plane within a single sensor. Prior to the mission, the image sensors were tested for resistance to shock, vibration, radiation and temperature extremes. The cameras had minutes to capture as much data as possible during the fly-by. Radio signals take around 4.5 hours to reach Earth from Pluto. To view more photos, visit http://www.nasa.gov/mission_pages/newhorizons/images/index.html.